Your support helps us to provide these unique and life changing opportunities for wounded, ill and injured service members and veterans. All of our funds go directly to programming to teach participants the skill of sailing, and continue their involvement in the sailing community. Your support can come in many forms. Please find a way that you can help benefit our cause. With your help, we can make a true impact on people’s lives. Your money goes to helping the participants! It takes money to provide opportunities. Please contact us to make a contribution towards changing the lives. Randy, Lennie, and their Leopard 48, SV Happy Together, have been logging miles to some of the most exotic cruising destinations out there. When they came across Warrior Sailing for the first time, they couldn’t help but get involved. Over the past two years the SV Happy Together team have been generous supporters of the program, hosting sails in San Diego, teaching Warriors about the cruising lifestyle, and making us the official non-profit benefactor of their wildly successful online blog and YouTube channel. Those wishing to follow Randy and Lennie’s lead can make a donation to Warrior Sailing via their website at svhappytogether.com. The SV Happy Together Crew have pledge to provide a t-shirt to all those donating, but you must donate through their page to receive it. Your business can help Warrior Sailing Program in multiple ways. Corporate assistance can be in the form of event sponsorship, training camp support, sponsored dinners or helping the Warrior Sailing Team. Give support and get noticed. Contact our Program Director, Ben Poucher. You might not have tons of cash to give, but Warrior Sailing Program always needs items for our success. Your professional skills or contributions could help us by providing services related to; grant writing, legal assistance, logistical assistance, boat parts, safety equipment, meals, travel expenses, accommodation assistance, coach boat loans, dockage, sails, trailering assistance, boat storage, shipping services, etc. If you have an idea or have an in-kind donation that could make our camps more successful, please contact Cory Kapes immediately! Your boat could be donated to support the Warrior Sailing Program. The USMMA Sailing Foundation is the parent organization of the Warrior Sailing Program and can facilitate the donation of your boat to this great cause. Contact Ralf Steitz. After making a donation to Warrior Sailing, those wishing to show their support by sporting Warrior Sailing gear can purchase it through the Warrior Sailing apparel marketplace. Please note that Warrior Sailing does not receive any financial incentive from the marketplace and all sales are between the customer and hosting apparel company. 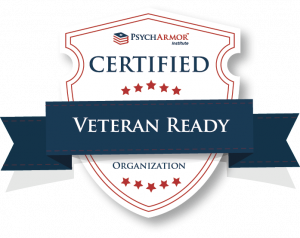 We are proud to be a certified Veteran Ready Organization by the PsychArmor Institute.